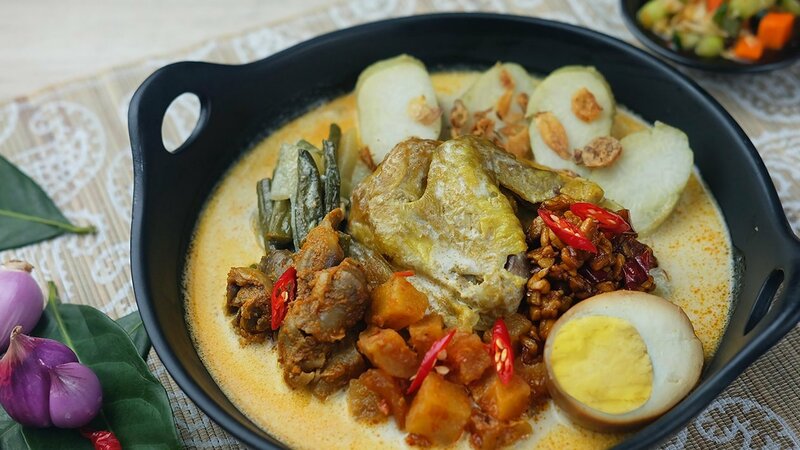 Lontong Cap Gomeh is a mixed-up of Indonesian cuisine from Chinese traditional dish, into Javanese cuisine. This dish is served with lontong, chicken opor, vegetable lodeh, fried liver sambal, pindang egg, beef abon, koya powder and pickle. Saute Royco Bumbu Dasar Ayam kuning, then add the chicken that has been cut, and red pepper milled. Sauté until the water comes out, put water and bay leaves. Add the coconut milk and Royco Pelezat Rasa Ayam. First prepare the banana leaves and cut into pieces and burn for a while. Rolled like lemper and tip pinned with leaf sticks. Put the rice into, just half of it, then pour the stick on the other end. Enter into the pan and enter the water until submerged. Boil for 5-6 hours duration, if the water is running low add hot water back. If the rice feels solid, signify it is cooked, then flush with cold boiled water to keep the banana leaves clean. Then place it sideways so that the water is completely drained. Saute the grounded spice until fragrant, then add red chili and stir fry to change color, add galangal, bay leaves and liver ampela until soft. Add the thin coconut milk, Royco Pelezat Rasa Ayam, and Bango Kecap Manis. Add the bay leaves and galangal. Cook until the coconut thickens and ready to serve. Young jackfruit boiled with coconut milk until done. Then add the grounded spices, shrimp, bay leaves and galangal. Add in order of chayote, melinjo fruit, chili, eggplant, nuts and thick coconut milk. Cook until cooked and lift. Combine all the ingredients above and cook into one, stirring occasionally. Cook until seasoning is thickened and absorbed by tofu and eggs. Arrange lontong on the plate. Pour chicken opor and sayur lodeh above lontong. Pour liver ampela fried sambal and abing seasoning. Lontong Cap Gomeh ready to serve.